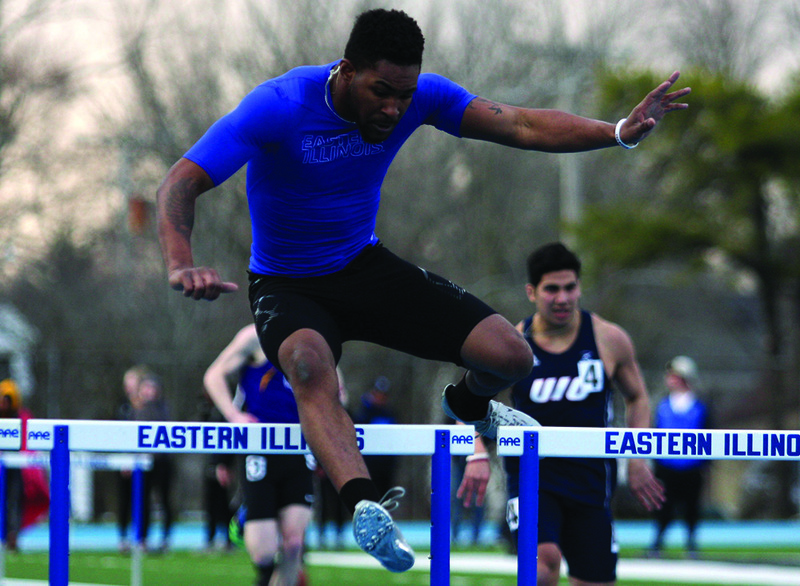 Eastern sophomore Cedric Johnson runs the 110-meter hurdles on March 30 at the EIU Big Blue classic at O’Brien Field. Johnson ran the event in 15.85 seconds and placed in 5th. 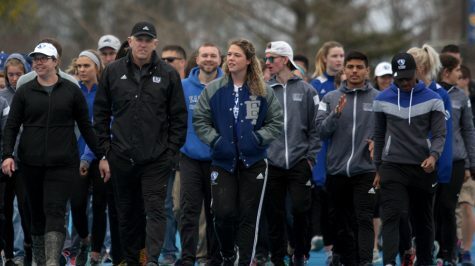 Inclement weather expected over the weekend forced the Eastern track and field team to head to Western Kentucky on Friday instead of its scheduled meet at Indiana State. 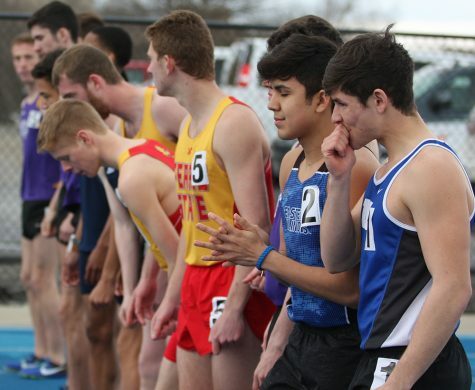 A forecast of snow has pushed the meet to just one day with events beginning at 9 a.m. and wrapping up around 1:30 p.m.
Western Kentucky has just two meets under its belt for the outdoor season. The team most recently competed in the Pepsi Florida Relays where it competed against 90 collegiate programs. The Hilltoppers finished the meet with eight top-15 finishes on the day. Desmond Mobley placed highest for the team with his third place finish in the long jump where he leaped 7.57 meters. Eastern senior Davion McManis holds the Panthers’ top long jump performance of the outdoor season. At the Big Blue Classic, McManis jumped 7.26 meters. Western Kentucky’s men’s 4×400-meter relay team clocked in at 3 minutes, 7.10 seconds for a fourth-place finish. Eastern’s top 4×400-meter team consists of sophomore Bradley Phillips, junior Michael Miller, junior Cedric Johnson and junior Michael Brown, and the foursome holds the track team’s fastest time at 3:38.21. On the women’s side, Western Kentucky’s Ariel Terrell finished ninth in the 400-meter hurdles with a time of 1:00.06. Eastern junior Pedra Hicks is just shy of Terrell’s time, with the Panthers’ top 400-meter hurdle time of 1:00.35. Morgan McIntyre posted Western Kentucky’s top finish in women’s field events. In the pole vault, McIntyre cleared 3.80 meters to take ninth place. The Eastern women’s team does not have a pole vaulter. This will be Western Kentucky’s first and only home meet of the outdoor season. Eastern also held its first and only home meet of the season last weekend. At the Big Blue Classic, Eastern posted seven first place finishes with the men placing second and the women placing third. Eastern’s strengths going into the Western Kentucky Hilltopper Relays on the men’s side lies in its sprints squad. Freshman Tadiwa Mhonde placed first in the 200-meter dash last weekend with a time of 22.31 seconds. Mhonde currently holds the fastest time in the race for the team. Mhonde also placed second in a neck-and-neck 100-meter dash race which he finished in 10.78 seconds. Senior Devante Smith won the race with a time of 10.71 seconds. The talent on the women’s team is evenly spread among track and field events. Seniors Brion Portis and Haleigh Knapp each placed first in their respective field events at last weekend’s meet. Portis took the triple jump title with a jump of 40’5.50”, and Portis also won the long jump event. Knapp cleared 5’8” in the high jump to take the top spot. Junior Grace Rowan boasted a fifth place win for the women’s distance team with a 4:44.87 run in the 1,500-meter race. Hicks, sophomore Louisa Rieger and seniors Stephanie Dominguez and Darneisha Spann won the 4×400-meter relay with a time of 3:57.71. The Western Kentucky Hilltopper Relays will take place in Bowling Green, Kentucky. The Panthers will be back in the state next weekend as they travel to the University of Illinois for the Illinois Twilight meet.